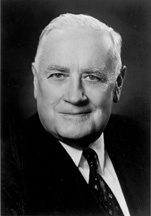 WILEY, Alexander, a Senator from Wisconsin; born in Chippewa Falls, Chippewa County, Wis., May 26, 1884; attended the public schools, Augsburg College, Minneapolis, Minn., and the University of Michigan at Ann Arbor; graduated from the law department of the University of Wisconsin at Madison in 1907; admitted to the bar the same year and commenced practice in Chippewa Falls, Wis.; district attorney of Chippewa County 1909-1915; unsuccessful Republican candidate for governor in 1936; engaged in agricultural pursuits and banking; elected as a Republican to the United States Senate in 1938; reelected in 1944, 1950 and 1956 and served from January 3, 1939, to January 3, 1963; unsuccessful candidate for reelection in 1962; chairman, Committee on the Judiciary (Eightieth Congress), Committee on Foreign Relations (Eighty-third Congress), resided in Washington, D.C., until a few days before his death, May 26, 1967, at High Oaks Christian Science Church Sanitarium in Germantown, Pa.; interment in Forest Hill Cemetery, Chippewa Falls, Wis.
American National Biography; Dictionary of American Biography; Wiley, Alexander. The Committee on Foreign Relations. Annals of the American Academy of Political and Social Sciences 289 (September 1953): 58-65; Wiley, Alexander. Laughing With Congress. New York: Crown Publishers, 1947.